Back in the 1960s, Marcos Engineering didn’t have enough money to display their Mini-based sports coupe at the Earls Court Motor Show like all the other manufacturers. So, they took a picture of the car outside the show, printed up a bunch of them, and handed them out to as many show goers as possible in a brilliant piece of guerrilla marketing history. 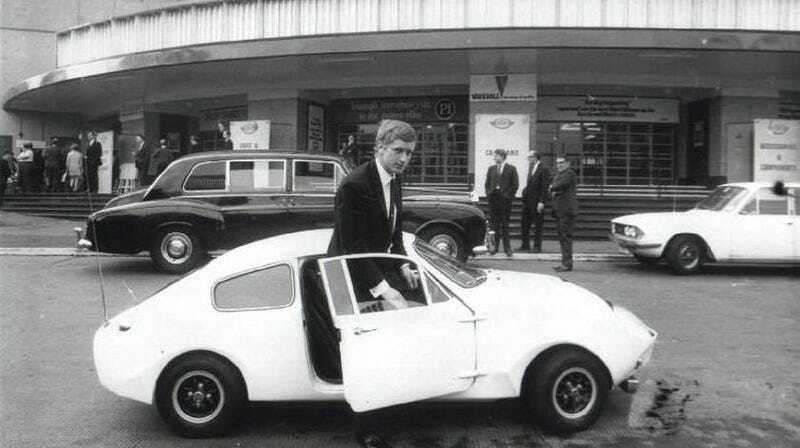 ﻿One very desirable piece of sports machinery that will not be on show at the London Motor Show which opens on Wednesday (15-10-69) at Earls Court is this Mini Marcos GT car that is pictured outside the show with its builder, 21-year-old apprentice Malcolm Dudley from Birmingham. The car cost Malcolm 450 pounds to build himself. Being an apprentice, funds were naturally short, so he kept saving, and each time he had enough money, he bought another part. When his kit was complete, it took him ten days to build. The car, with a top speed of 103 mph, will do a very economical 50 miles to the gallon. He used a Marcos conversion kit for a BMC Mini, with the 998cc Mini Cooper engine. He added modifications to suit his own taste—for instance the rear lights are the same as used on Birmingham Corporation buses, and the horn has come from a boat. He carried out his trials on a local airfield, and the local authority tax office has approved it as fully roadworthy. Although the car will not be on show at the Motor Show, it will be the talking point at the Engineering Exhibition being held in London. Malcolm has submitted a paper describing how to assemble the car and the problems he had to overcome, as his entry in the engineering industries group apprenticeship scheme. He doesn’t expect to win any prizes, but he has got his own sports car out of the project.